Last week I talked about poison ivy, oak and sumac, warning you to watch out for it on your trail runs or bike rides. This week, I will discuss what little creatures can do to you if you are not careful. Years ago, my wife managed to attract a tick behind her knee. At first, she thought it was a scab. When she couldn’t get it off, she called me to take a look. My comment was “you have been hanging around the dogs too much”. Lucky for her, ticks in Jamaica do not carry Lyme Disease. Here in Ontario, we aren’t so lucky. Lyme disease is caused by bacteria that are transmitted to humans through a bite from an infected black-legged or deer tick. Symptoms can occur anywhere from 3 to 30 days after the bite and can be wide-ranging, depending on the stage of the infection. In some cases, symptoms can appear months after the bite. Black-legged ticks must be attached to you for 36 to 48 hours to transmit Lyme disease. If you remove the tick or ticks within 48 hours, you aren’t likely to get infected. Early signs and symptoms include fever, chills, headache, fatigue, muscle and joint pain, and swollen lymph nodes -- all common in the flu. 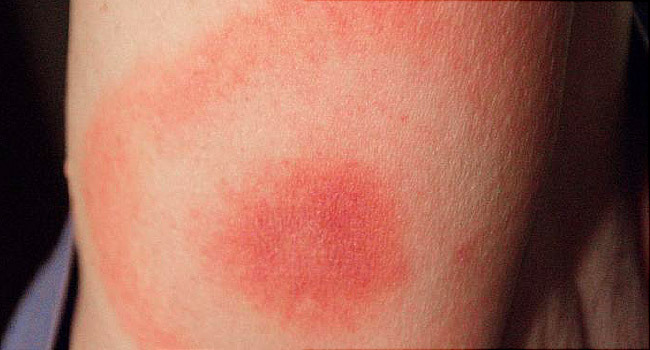 In up to 80% of Lyme infections, a rash is one of the first symptoms. · Loss of muscle tone or “drooping” on one or both sides of the face. About 20% to 30% of Lyme rashes have a “bull's-eye” appearance -- concentric circles around a center point -- but most are round and uniformly red and at least 5 centimeters (about 2 inches) across. Most are just red and do not have the classic ring within a ring like the Target logo. The rash expands gradually over a period of days and can grow to about 12 inches across. It may feel warm to the touch, but it rarely itches or is painful, and it can appear on any part of the body. What’s the best way to prevent a tick bite? · Wear pants and socks in the woods, areas with lots of trees. · Wear a tick repellent on your skin and clothing that has DEET, lemon oil, or eucalyptus. · For even more protection, use the chemical permethrin on clothing and camping gear. · Shower within 2 hours after coming inside, if possible. · Look at your skin and wash ticks out of your hair. · Put your clothing and any exposed gear into a hot dryer to kill whatever pests might remain. How to tell if you’ve been bitten? Given that the ticks are very small, you’ve got to have pretty good eyes. if you’ve been running or riding in the woods or in tall grass, check your skin afterward, ideally in the shower or bath. That way, you’ve removed your clothes, which may carry ticks, too. Remove it with a pair of fine-tipped tweezers as soon as possible, pulling upward with steady pressure. If parts of the tick remain in the skin, also try to remove them with the tweezers. After everything is out, clean the bite area with rubbing alcohol or soap and water. Ideally, you want to remove the tick within 48 hours. Stand-up Paddle Boarding....cool fun way to get fitness in.